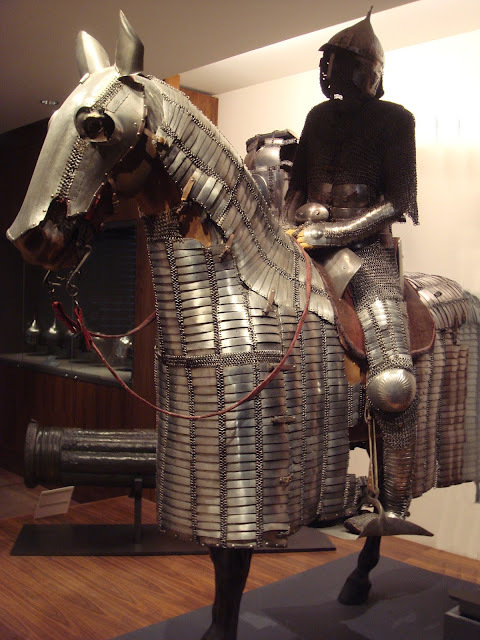 Conventional thinking holds that the stirrup was developed in Asia to aid the physical balance of warriors in battle allowing mounted archers to stand in their stirrups and shoot their arrows. The stirrup was so successful that beginning in the 8th century and during several of the ensuing centuries it became part of the equine kit for all European male riders. 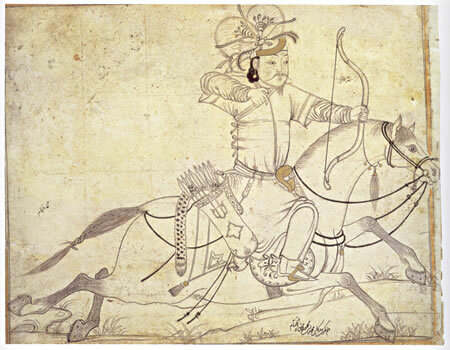 During the European medieval period, mounted Asian and Middle-Eastern archers wore a high-heeled shoe that is thought to have acted as a brake to stop the stirrup from riding up the leg. This heeled shoe has become the progenitor of the Western male high heel; at least that is how it is presented. This may be true, but over the years I have ridden horses and taken lessons to develop a good seat; something seems wrong with this logic of the heel and stirrup, at least for the average rider. The heel and stirrup approach assumes that locking the heel against the stirrup provides stability. Modern riding operates on the principle that the stirrup accepts the pressure of the foot at the ball of the foot, not the arch or heel. The stirrup provides a stable platform, but the weight of the rider should be carried down through the heel, hence the idea of keeping your heels down while riding. Riding closer to the heel means that the weight and balance of the rider are nearly in the same place. By doing this, a rider runs the possibility of locking their foot into blocked position. That is not to say that it is never done. Some riders may use this method of heel lock for a specific purpose. In jumping circles the phrase for placing the boot through the stirrup and putting the weight on the arch is ‘jamming it home.’ However, this style of riding is the exception rather than the rule. A rider needs to know how to dismount quickly and efficiently. Everyone, myself included, who has ever fallen from a horse to the ground with a foot still caught in the stirrup, understands the panic that ensues and the need think clearly to disengage. 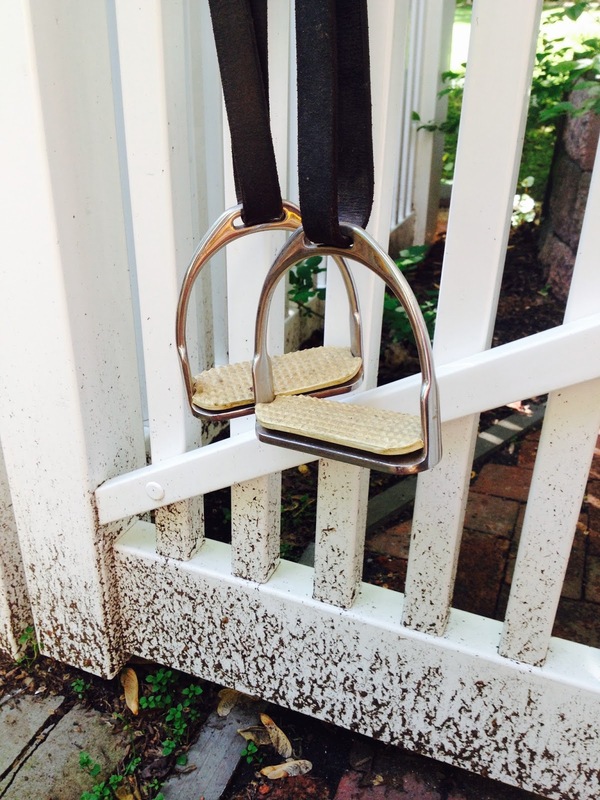 Stirrups were designed to stabilize a rider’s foot, but they can also be the bane of a rider. Any rider who uses stirrups spends time learning how to get out of them. As mentioned above, the problem with stirrups is that riders’ feet can get trapped in them. To better understand how stirrups and heels do not always work well together here is an example of heel-stirrup mishap. In this scenario a rider falls or is bucked from a horse. For this example assume that prior to the fall, the rider’s foot slid through the stirrup and jammed at the heel, meanwhile the front of their foot moved upward coming to rest against the arc of the stirrup, which in essence made the stirrup a buckle with the foot acting as the tongue. Because of this locking as they fell they were still attached to the saddle and thus to the horse. If the rider was lucky, the horse stopped resulting in relatively minor injuries to their ego and body. However, if the horse continued to move then the rider, now an extension of the horse could be bounced and dragged across the ground with far more serious consequences. If the heel was designed primarily to lock a warrior in place, then horsed combatants were, in essence, expendable, expensive but expendable. The next installment will examine the spur. What Shoes Did Mistress Firebrand Wear?